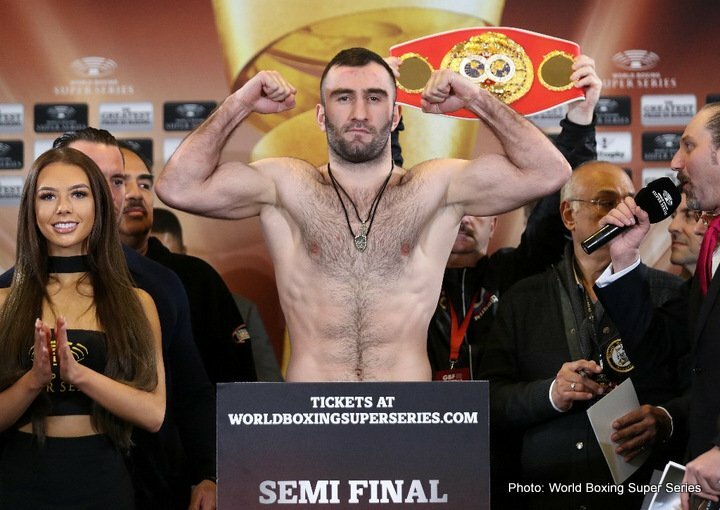 IBF World cruiserweight champion Murat Gassiev (26-0, 19 KOs) came on strong in the 12th round in knocking WBA World cruiserweight champion Yunier ‘The KO Doctor” Dorticos (22-1, 21 KOs) in the World Boxing Super Series tournament at the Bolshoy Ice Dome in Adler, Russia. Gassiev, 24, knocked Dorticos down 3 times in round 12 to get the stoppage win. The final knockdown by Gassiev knocked the 31-year-old Dorticos through the ropes. Referee Eddie Claudio stepped in at the point and halted the fight. The official time of the stoppage was at 2:52 of round 12. In round 11, Gassiev hurt Dorticos with a big left uppercut followed by a right hook that had the Cuban fighter out on his feet. With the win, Gassiev advanced to the finals of the World Boxing Super Series on May 11th to meet up with WBC/WBO cruiserweight champion Oleksandr Usyk (14-0, 11 KOs).